Kavanaugh's confirmation fight has nearly broken the Senate. Can it recover? “I love the Senate, but I’ve never been so appalled at this intuition,” said Sen. Brian Schatz, D-Hawaii. WASHINGTON — In a country divided, the U.S. Senate is not immune. The battle to nominate Supreme Court nominee Brett Kavanaugh has deepened division and distrust in a chamber already fraught with partisan fights, ripe with raw emotions and filled with frustration among senators who say this is a low point in the body’s existence. While there’s hope among senators on both sides of the aisle that it can recover, it’s not clear how that happens. “The road that led us here has been bitter, angry, and partisan; steeped in hypocrisy and hyperbole and resentment and outrage,” Schumer said on the Senate floor just before the vote to confirm Kavanaugh. With the stakes so high, any Senate decorum that remained during an already polarized era has dissipated, and the mood among senators of both parties reflected that. “I love the Senate, but I’ve never been so appalled at this intuition,” Sen. Brian Schatz, D-Hawaii, told a handful of reporters this week as the Kavanaugh's confirmation appeared imminent. Both sides knew the stakes were high in a fight that started over a Supreme Court nominee and ended as a major symbol of a cultural movement. From the moment Kennedy announced his retirement, Democrats mobilized, vowing to do whatever they could to stop a nominee who will shift the balance of the court to the right for a generation. Privately acknowledging that there was little chance they would be able to stop a nominee with only 49 seats in the Senate, including a handful of Democrats running for re-election in ruby red states, they sought to appease a determined base defiantly opposed to whatever nominee Trump was to nominate from his pre-determined list of Federalist Society candidates. On the right, Senate Majority Leader Mitch McConnell, who has successfully remade the federal courts with conservative judges over the past two years, was determined to move Kavanaugh’s confirmation as quickly as possible, in time for the beginning of the current court session and ahead of the midterm elections. Groups on the right spent tens of millions of dollars and kept up pressure behind the scenes on Republicans and President Donald Trump to press for the confirmation. In the Senate itself, the process broke down and personal relationships suffered. 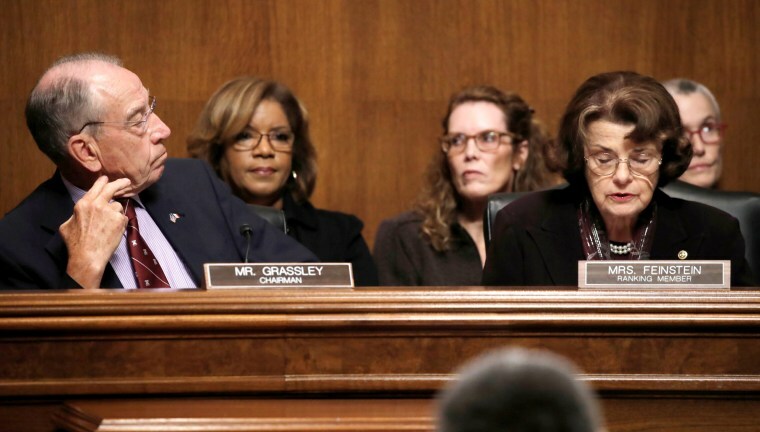 In perhaps the most glaring example, the top two members of the Judiciary Committee, Chairman Chuck Grassley and Ranking Member Dianne Feinstein, who are close friends, barely communicated throughout the process. The FBI investigation into allegations of sexual misconduct against Kavanaugh further divided members, as Republicans contended the follow-up probe didn’t corroborate Kavanaugh’s accusers and Democrats accusing Republicans of not allowing a thorough investigation in order to protect their nominee. The result was the most partisan vote to nominate a Supreme Court justice in the Senate’s history with all but one Democrat voting against him and all but one Republican voting for him. Now that he’s confirmed, senators says they want to move forward, but letting go of the hard feelings created throughout the heated debate will not be easy. “I think we need to restore civility to the process,” Collins said Saturday leaving the Senate floor after the vote, flanked by half a dozen police officers because of threats to her safety. Sen. Lisa Murkowski of Alaska, the only Republican to oppose Kavanaugh, said she’s taking a first step to restoring comity. While opposed to the nomination, she voted “present” so that Sen. Steve Daines, R-Mont., could be at his daughter’s wedding instead of being forced to remain to cast his vote in support. “It will not change the outcome of the vote, but I do hope that it reminds us that we can take very small, very small steps to be gracious with one another and maybe those small, gracious steps can lead to more,” Murkowski said. But the process has been breaking down for years. In 2013, Democrats held the majority. Frustrated with the inability to overcome Republican objections to President Barack Obama’s nominees, they changed the Senate rules to allow judicial nominees, except for the Supreme Court, to be confirmed with the 50-vote threshold, instead of 60 votes. When Republicans regained control of the Senate and President Donald Trump named his first Supreme Court nominee, McConnell removed the 60-vote threshold for the high court, effectively cutting out the need for bipartisan support. After the bitter fight over Kavanaugh, members on both sides of the aisle say they’ve thought about restoring the 60-vote threshold for Supreme Court nominees, but acknowledge that it’s not likely to happen. Retiring Sen. Bob Corker, R-Tenn., said both parties are to blame for the acrimony in the Senate. He said the 60-vote threshold will never be reinstated. “Thirty years from now, if senators start acting with self-restraint again, maybe. In the next couple of years, it’s not going to happen,” Corker said. Durbin said that the best thing the Senate can do is to move on. “I think the most important thing we can do now is to find some constructive bipartisan things we can work on such as appropriations bills,” Durbin said. Meanwhile, McConnell, giddy with pride over confirming Kavanaugh, dismissed deep Senate fracture. “We've had some other low points. We always get past them,” McConnell said. Frank Thorp V and Marianna Sotomayor contributed.